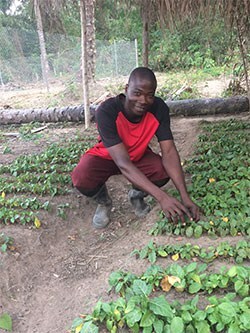 The World Vegetable Center, in partnership with local collaborators, is developing appropriate vegetable seed kits along with participatory training systems for the production of nutritious vegetables through home gardens. Nutrient‐dense traditional African vegetables provide an excellent means to complement cereal staples for better nutrition, in particular for women and children, as well as for income generation. This study characterized the production of traditional African vegetables in Burkina Faso. Director General Marco Wopereis recently returned from his first official trip to Europe and Africa, where he met staff, current and potential partners, and donors. In Montpellier, France, he had discussions on collaboration between the Center and CIRAD (Centre de Coopération Internationale en Recherche Agronomique pour le Développement) and attended the CIRAD Scientific Council Meeting from 8-10 June. CIRAD has strengths in field agronomy and modeling, vegetable breeding, food safety and market linkages in Africa. In Mali from 14-17 June, Marco met with the World Vegetable Center’s West and Central Africa team at the office in Bamako, and representatives of government and nongovernmental organizations. Mali seeks support to develop its horticultural sector, particularly the vegetable seed sector. Tempting recipes and great music will have you cooking Burkina Faso-style!